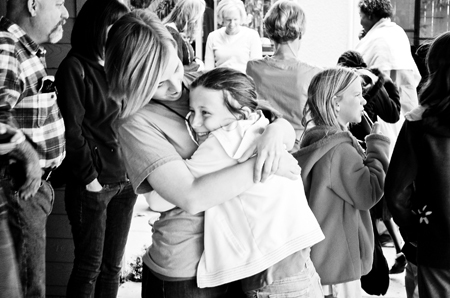 At CCC we are striving to live out the Great Commandment and the Great Commission, Love God and Love Others. We think that Jesus left these two mandates for the church in order to guide us in our mission to follow his vision of grace and love for the world. We are conscious of our need to “practice what we preach,” so we work toward becoming a biblical community that accurately reflects Christ to the world. We want to awaken the desire for extraordinary encounters with God and be an environment in which people can thrive to become all that God sees in and for them, in the context of community, celebration, and wonder. We want our values to be living behavior so we always keep in front of us four instructions to the Church gleaned from the Great Commandment and Great Commission. These have become four essential practices we strive for: Worship, Community, Mission, and Formation. We want to be a church that celebrates God’s Presence in worship, incorporates people into God’s family through a deep sense of community, demonstrates God’s love in mission, and nurtures God’s people through spiritual formation. Worship: Living all of life as an expression of intimacy with Jesus. Community: Celebrating authenticity and transparency as we strive to know others and be known by others. Mission: Expressing God’s sacrificial love through relief, mercy, justice, and healing. Formation: Equipping each other to be Christ-like in all we are called to do.